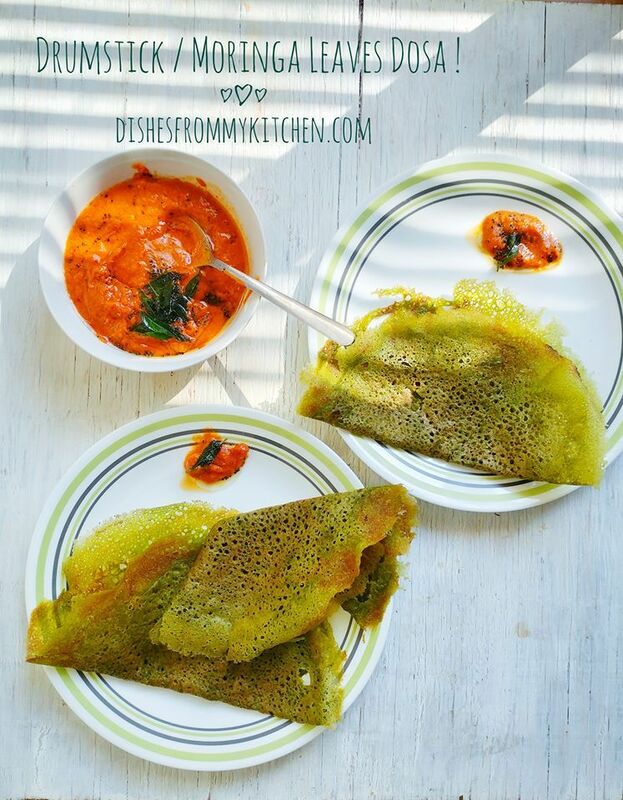 Dishesfrommykitchen: DRUMSTICK LEAVES / MORINGA LEAVES DOSA ! 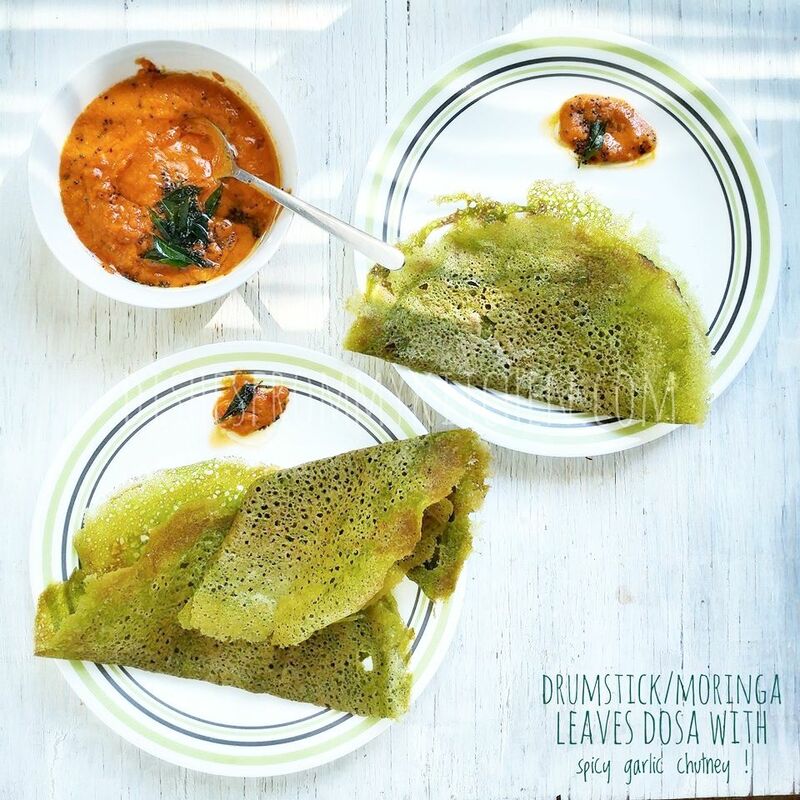 DRUMSTICK LEAVES / MORINGA LEAVES DOSA ! Hi all ,I am Blogging after so many months ...No no after a year. Yes I been busy with so many things, so my blog has taken a back-seat. I got a lot of messages from so many friends asking whether I stopped blogging. Definitely I don’t want to stop blogging. Priorities change all the times, so I took a big break from blogging. I used to spend hours together every week for daily cooking, shooting and posting in blog. I really miss those days and feel guilty of not doing those now. That being said, does not mean I am not cooking and taking pictures, I am very active on FACEBOOK and INSTAGRAM. I do cook a lot and take pictures (Using my phone) .. During the time of the day when I shoot pictures, I don’t have the luxury and time to take pictures with my camera :(. When I post pictures in social media, I get lots of recipe requests, which is a one thing that made me comeback to blogging. I should thank my wonderful friends and followers who encouraged me to do my blog again. I want to bring to all of your kind attention, I have been tired of hearing people writing my relative or school friend taught me or gave me this recipe and end up taking an other person's recipe and do very slight change to the recipe. You are most welcome to use this recipe with due credits. I have done my home work and have not found any recipe in the Internet, that is remotely close to what I have. To start off with I will post recipes requested by so many friends and followers in FB and Instagram. I am going to use the pictures taken with my phone, I don’t want to redo the dishes again just for taking the picture. Let me post whatever picture I have and try to update them with DSLR pictures when I do them in future. Hope to see you all regularly here .. Stay tuned. 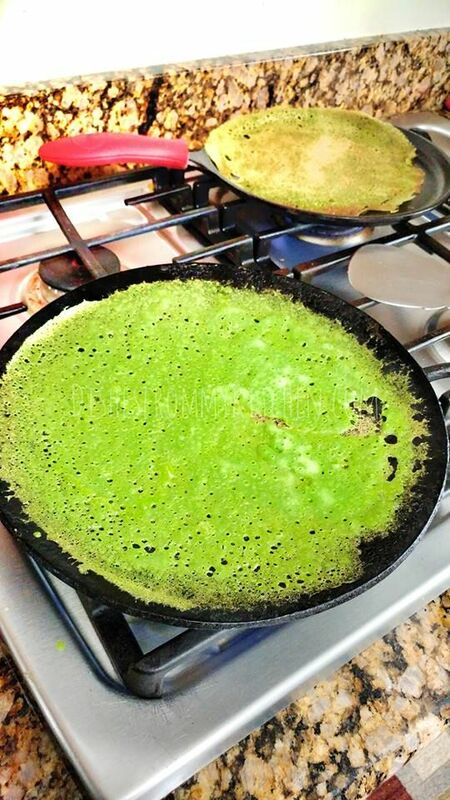 Here is the recipe for superfood Moringa Dosa/ Drumstick Leaves Dosa. I usually don't get Moringa leaves in Indian grocery store where I live. But off late I am getting these leaves. These are one of my favorite greens. I have been making so many dishes using this leaves, which I have been missing all these years. 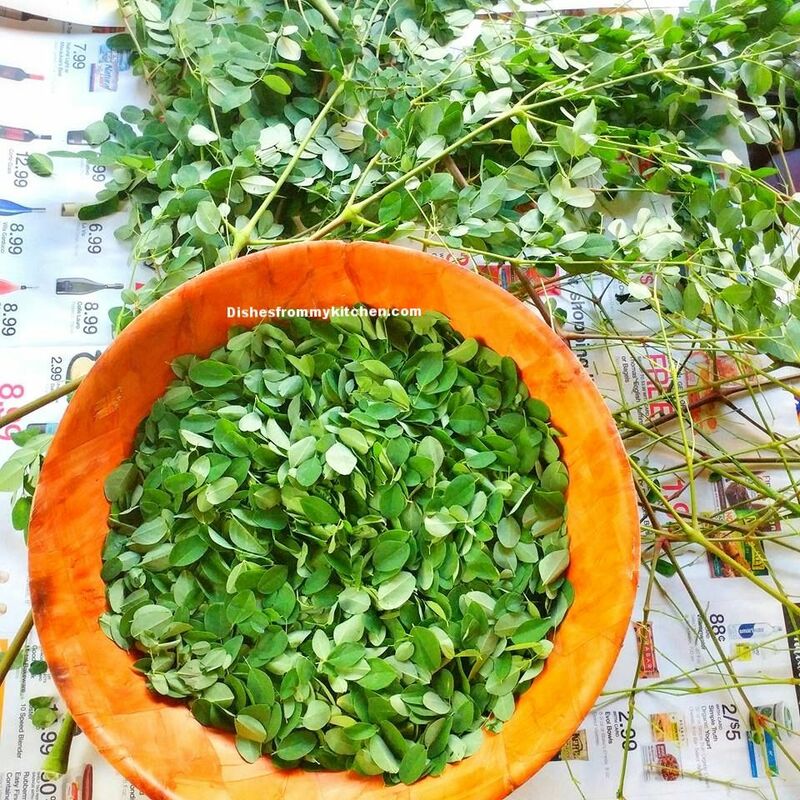 So I am putting them into full use :) :) Moringa/ Drumstick leaves which is commonly touted as a superfood since it is rich in nutrients, antioxidants and other beneficial compounds. Back home in India Moringa leaves / drumstick leaves are given to new moms which helps in improving and boosting Lactation. Sharing one of my favorite dosa. It is so flavorful and its wonderful combo with Spicy garlic chutney. Even though seperating each leaves from the stem is a tedious process.. it’s always worth it and you will feel the amazing aroma of the green goodness. Let me know if you are interested in more Moringa/ drumstick leaves recipes.... Do comment below. 1. Wash and soak rice for 3 to 4 hrs. 2. Grind the leaves and soaked rice smoothly with required salt. 3. Ferment the batter overnight. 4. While making dosa dilute it with water. Batter has to be like Rava Dosa consistency. 5. Heat the skillet. Pour a ladle full of batter starting from the edges of the skillet in a circular way. 6.Since the batter is loose it auomatically fills the middle part , unfilled part can be filled with the batter using the ladle. 6. Add 1 tsp oil , when it turns slightly brown on the edges flip it over and make crisp on other side too. 7. Serve with Spicy Garlic chutney. Dosa tastes great with Idli spice powder, tomato chutney , onion chutney or coconut chutney as well. Enjoy the yummy aromatic and healthy Dosa !!! No dhal just rice ?? Made adai,dosai sounds interesting! Pavithra, just liked the caution part you have written in orange font..yes its very sad to see our recipes in others blog without giving us credit. it is so good to see you blogging again Pavithra. Have missed your posts and your gorgeous photos here (I follow on FB and IG, so I know you have been cooking a storm). TAWA PULAO ! KIDS LUNCHBOX ! PUDINA / MINT POHA ! KIDS LUNCHBOX !